New Court House expects every man’s vote. A force of men are at work fitting out the steamer Minnie M.
Wm. Harper came home from a tour in southern Michigan to vote for a new Court House. That’s the kind of sentiment Grand Haven voters will show. The Herald office foreman’s best girl would be after him is she knew what transpired every noon. RALLY CITIZENS!—Every citizen work for a new court house. See that every voter in your ward votes for the court house. YOUNG MAN’S DAY—Show what you can do Monday for a big vote for the new court house. Cobb & Stokes’ new steamer now building will be completed about the first of July. If trade warrants it, both her and Nellie will run on the Fruitport route the rest of the season. The new boat is about 20 feet longer than the Nellie and will be a welcome addition to Grand Haven’s fleet. August Gruntz, who will be remembered was so badly injured on the C. & W. M. Ry. Some years ago has brought suit against that railroad for $2,000. The new method of voting still puzzles many. 80 odd votes were lost at the Spring Lake election. It now transpires that the factory visits of the eight ladies are of a social and not a political nature. We always suspected the first rumor was wrong when we heard several of the party speak of themselves as handsome (whew!) and young (Oh! This is awful.) Later developments and their own statements corroborate our suspicion. Well girls the Globe Match Co., will soon be making “matches” again, if that’s what you want or otherwise you should visit the freight-house in the evening instead of the afternoon when you want to borrow “his” pencil. MR. EDITOR—I am informed that we can hopefully look for Henry VandenBerg as a Sunday man. Therefore hoping that one and all will look for the good of Grand Haven’s week days as also our Sundays. The haunted house is still causing a good deal of excitement. Mr. Stites the owner arrived from Millington Ill., on Thursday to make an investigation. Several of the residentors of the neighborhood have watched the house all night. Your correspondent put in one night, but failed to see or hear any spirits. About sixteen or twenty years ago, spirits were seen in the building frequently and an old citizen says (“darned bad ones too.”) In fact the building or part of it was the notorious old Johnsonville saloon kept by Johnathan Beaver and also by Ben Haymond. It was built by Gideon Harris who pre-empted the lands where Agnew is built. Many were the broken heads and sick stomachs caused by the spirits in the haunted house in those days. Mrs. Geo. W. Harris and Mrs. Stone on Thursday saw more unnatural sights in the house so the excitement continues. Fish tugs are out today. No ice on this shore. The vote in the 1st ward up to noon was quite light, only about ninety votes being polled. The upper works of the two new steamers just launched at G.H. Ship Building Co’s yard are being completed. Capt. Ed. C. Bennett of the Custer Guard, is now the senior captain of the line and until Grand Haven elects a new head, Capt. Boon of the Innes Rifles will remain junior captain.—G. R. Dem. Manger Hutty has made arrangements with Capt. Cobb of the steamer Nellie to run that steamer on the first trip of the season the night of Galatea. This will give Spring Lake and Fruitport people an opportunity to see the play. G. W. Miller is experimenting with a peculiar kind of glass for hot houses. It is thicker and not so transparent as that used in hot houses. Mr. Miller also warms his hot houses in a different way from the other celery men. Instead of heating from above he has the pipes running under the celery beds. Grand Haven will watch with interest the returns on the Court House vote as they come in tonight. In fact many people care less about the result of the municipal election this year than the Court House question. Much credit is due Geo. W. McBride and ex-Senator Ferry and the outside newspapers for their effort in its behalf, whether it passes or not. Fred Hovey lost his reputation as a hunter. At least that’s what those who know say. Fred went hunting up to Bruce’s Bayou the other day. “Just my luck,” says he as he spied a fine flock of ducks lying motionless on the water. Despite the fact that the dogs were barking the duck did not move. Fred took careful aim and banged away with both barrels. The yell of nearby hunters was far louder than the report of twenty guns. It was a decoy of ducks that he had shot into. Mr. Hovey is not easily abashed but it is reported that his face was very cringed just then. That’s the Way to Talk. The early residents from way back to the 50’s, still remember the days of the wild pigeon, and especially the spring of ’59 when they located en masse in the shrub pinery north of Port Sheldon, and made those low woods their nesting grounds. They covered at least a tract of a mile square and every tree contained from one to six nests. Pigeons were “long” in those days, at every family table as well as in neighboring markets. Catching and shipping pigeons during that period was a business of no mean importance, and was kept up for weeks, until the young ones were old enough to leave their nests, when the entire flock migrated further north. Spring Lake is in the throes of a hot election today. The fight for Supervisor is an especially exciting one. Robert Convey returned from a trip to Saginaw Saturday, where he has been after timbers for the approach to the Spring Lake bridge. No timber of the desired quality could be obtained here. The steamer Barrett will begin regular trips about April 10. The Valley City’s immediate future is still undetermined. Her principle owners want the boat to run in conjunction with the Barrett as a daily line, but the Barrett’s principal owners are said not to favor the plan. Most people do not know the effects of the severe electrical storm of early this morning were felt in this city. The tall flag pole of the weather bureau on the Cutler was splintered slightly by lightning. The bolt did not enter the house but was undoubtedly carried along the metal roof to the rear by telegraph and telephone wires. Timbers are expected this week for the approach to the Spring Lake bridge. They come from Bradley on the F. & M. Ry. Iron cords and supports are expected this week from Chicago. “This has been one of the severest winters we have had in years,” said Capt. James Martin of Milwaukee master of the Roanoke, plying between Grand Haven and the Cream City, in the Morton Friday. “The weather has been terrible most of the time and the ice uncommonly bad. Everything points to the fact that there will be an extraordinarily carrying trade this year. I do not believe this car ferrying across Lake Michigan will amount to anything” said Capt. Martin in reply to a question. “They can do all right, but the expense is enormous, and I doubt if it will be practicable on that account. The Grand Haven harbor is all right. I came in this morning with a big load and was not troubled a bit. The sand bar seems to have gone down. At least it was not as bad as it was.”—G. R. Democrat. That the resorts on Spring Lake will boom is evident, as wealthy Chicago parties are making investments there. John Torrent was elected Mayor of Muskegon by 616 plurality. Wm. Franks was elected Alderman of the 7th ward by 18 plurality. The graduating class of the City Schools this year will consist of three young gentlemen and six young ladies. The Chicago life saving crew of last year are stationed at Ludington this year under Capt. St. Peter. The Ludington crew are stationed at Jackson Park. A boy named Jake Wieses attempted to cross the river in a canoe from the Electric Light plant this morning. The canoe was upset in the middle of the river and the boy would have been drowned undoubtedly but for the timely assistance of Capt. John DeYoung and a Mr. Van Hall who rowed out and rescued him. D. O. Watson is Collector. President Cleveland sent to the Senate yesterday morning the name of Dudley O. Watson for Collector of Customs, Grand Haven district. The Senate will beyond a doubt act favorably upon the nomination and Mr. Watson will take G. W. McBride’s place at once. Grand Haven people watch with delight, the arrival every year of the first Goodrich steamer. When the well known whistle of the steamer Atlanta was heard this morning people flocked to the docks. She looks the same fine appearing craft as last year only brighter and newer; the result of fresh painting. She had as passengers some 15 or 20 persons who enjoyed the trip immensely. Also a goodly cargo of locals and D., G. H. & M. freight. The Atlanta is commanded this year by Capt. Wm. Nicholson a pleasant and affable gentleman who once called the Valley City his home. He takes the place of the venerable Capt. Rossman who died the past winter. Orlando J. Parker of Grand Haven is first mate. Wm. Gardner well known here as a sailor in past years on the D., G. H. & M. boats is 2nd mate. The important duties of purser are attended to by a Mr. Nims. Byron Heerman a well known Ottawa County man is first engineer. Last but by no means the least comes Harry Morris who is steward of the ship. The Court House is Ours. Ottawa County vindicated herself yesterday by voting that a new and commodious court house be erected in this city. Grand Haven people watched the results with anxiety. When the news came that Holland had gone for the court house by 35, hope began to arise. This good news was followed quickly by reports of big pluralities for the court house in Zeeland, Spring Lake and Crockery. With three townships (Georgetown, Blenden, and Olive) yet to be heard from the majority for the Court House is considerably over a thousand. Those townships with their combined votes could not break down that majority. The following pluralities were given for the Court House; Grand Haven City 900, G. H. town 140; Spring Lake 220, Holland City 35, Holland town 28, Tallmadge 49, Crockery 95, Zeeland 187, Robinson 25. Against; Jamestown 44, Wright 200, Polkton 100, Chester 132, Allendale 120. 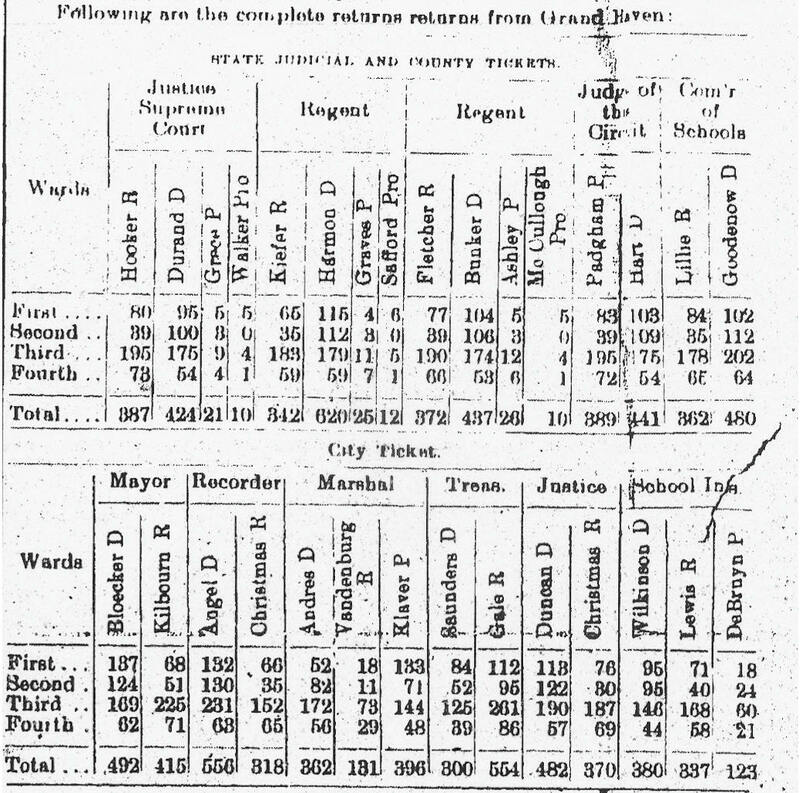 Complete City, State Judicial and County election returns can be found on the Tribune microfilm at the Loutit Library. The State Commissioner of Schools was won by the female candidate D. Goodenow. Women did not have the right to vote at this time but were allowed to run for some offices. Numerous complaints are heard of boys stoning birds, to the danger of pedestrians and nearby windows. A raft of logs for Silas Kilbourn & Co. was towed down by the tug Stickney this morning. Mrs. Page will trim hats this season at her home on Water St. Trimming, from 25 to 50 cents; making, from 50 cents to $1.00. The government dredge is at work at the bend in the pier which was badly injured during the late high water. At a meeting of the pastors’ conference Monday Bishop George D. Gillespie, of the Western Michigan Episcopal diocese, declared in favor of church taxation, excepting hospitals, homes and parish schools, on the ground that they are benevolent institutions without which taxpayers would have more to pay. The pastors of three of Grand Rapids wealthiest churches favored the above plan. On March 26 the car-ferry steamer Ann Arbor No. 2 left Kewaunee for Frankfort at 5 a.m. with a train of twenty-four loaded cars, and returned light to Kewaunee at 5:10 p.m., having been absent just twelve hours and ten minutes. She was loaded at once and by 12 o’clock at night had delivered a second train of cars at Kewaunee. During the month of march the Flint & Marquette and Grand Haven steamers carried out of Milwaukee 210,807 barrels and 14,666 sacks of flour, 286,800 bushels of oats, 51,611 bushels of barley and 20,000 bushels of rye. The city officers now are: Mayor, Henry Bloecker; Recorder, Wm. N. Angel; Aldermen, James Lewis, Ed. Stokes, Joseph Koeltz, Wm. Thieleman, J. Glerum, James Verhoeks, John N. Lockie, Herman Nyland. It now devolves upon the new council to elect a city attorney, in place of W. I. Lillie. It now devolves upon the new council to elect a city attorney, in place of W. I. Lillie; street commissioner in place of John Kraai, Director of the Poor in place of John Baker, Supt. Of Water Works in place of Joseph Palmer and a City Physician in place of Dr. J. B. McNett. The fish catch is very small yet. The street cleaning force are at work. The social given by the Busy Bees at the M. E. church last evening netted about $15. Dan Swartz will have his fish fertilizing plant in operation in about three weeks. Already much speculation is indulged in as what kind of a court house Ottawa county is going to build. Chas. Peterson, one of the members of the Life Saving, has moved from Jackson St. to a residence near the pier. The law should be enforced in regard to killing robins and songbirds. Numerous boys about the city are destroying the few birds that migrate here. An arrest or two might serve as a reminder. The following officers were elected at the semi-annual meeting of the Young Men’s Band of Christian Workers last evening. President, E. L. Briggs; vice-president, John J. Bolt; secretary, Peter Ver Duin; treasurer, Christian Addison. The mill which Mr. Van Wormer will erect in Minneapolis will saw for A. C. Akeley. Grand Haven’s one remaining saw mill,—Baker’s, has quite a cut of logs ahead this season. Mr. John Macfie was elected an honorary member of Saint John’s church vestry for life, an honor never before given to any man in that church. One of the first acts that the next Common Council should adopt, is one ordering the City Marshal and Night Watchman to wear Police uniforms. The Grand Haven school exhibit for the World’s Fair is already made up and will be shipped to Chicago next Monday. Where is our Deputy Fish and Game Warden and who is he? Lamont and other points up the river report fish being caught unlawfully. Right here in Grand Haven song birds are being destroyed by young and ruthless ruffians and a stop should be put to it. The difference of the vote on the court house question compared with the vote on the city ticket will show the large number of void ballots in the last election here. There were 964 ballots on the courthouse question while only 865 were cast for the aldermen—a difference of 99. “Any person who shall at any time within this state kill any robin, night-hawk, whippoorwill, finch, thrush, lark, sallow, yellow bird, blue bird, brown thrasher, wren, martin, oriole, woodpecker, bobolink, or any song bird, or rob the nests of such birds shall be deemed guilty of a misdemeanor, and on conviction thereof shall be fined five dollars for each bird so killed or each nest so robbed, or confined in the city jail ten days, or both fine and imprisonment at the discretion of the court. For the past seven or eight days a trampish individual has been hanging around Rosy Mound. He put up at a small shanty and kept away from the neighbors as much as he could. Naturally the residents in the vicinity were somewhat afraid of the stranger, and when the house of Mat Kirsh was entered unawares the other day and several articles of food, and tobacco stolen, sheriff Keppel was informed. That officer with Marshal Klaver left yesterday afternoon to hunt up the follow. The officers spied him picking up chips near his shanty, but as soon as the fellow saw them he made an effort to get out of their sight. The marshal called to him to stop but he began to run, heading for some timber land not far off. The officers continued after him, but the fellow did not stop until near the woods when he probably concluded that he would be caught any way and hence gave himself up. He said that he was a sailor and had been living on the outskirts of the town waiting for an opportunity to ship on some vessel. After some questioning he admitted to entering Kirsh’s house and stealing something to eat. He said he had left a bag of clothes at Luhm’s in this city. He was brought to jail and taken before Judge Pagelson this morning on the charge of larceny. The judge sentenced him to 30 days in jail. The fellow gave his name as Barbey Cook. The office of night watch and poundmaster should have been mentioned as offices appointive by the new council. Peter Cook and John Schippers are the retiring officers in each position. Lightning entered the electric plant four times last night. The infant daughter of Mr. and Mrs. Peter Danhof died last night and was buried today. Obeke & Co’s tug crew is composed as follows: Anna: Capt. Adrian Obeke; Engineer, William Fisher; Crew, Peter Fisher, George Fisher, Frank Fisher, Henry Fase, Jake Fase. Tug Meister: Capt. Walter Fisher; Engineer, C. Van Zanten; Crew, Honas Fisher, Len Fisher, Jake Wissel and John Ekkens. During the month of March, real estate transfers in Ottawa County aggregated $125,922.89. The aggregate for the first three months of the year is about $260,000. by the end of the year, at least a million and a quarter of dollars will have exchanged hands through real estate. Ottawa Co. is not dead as these figures show. In Grand Haven transfers are picking up both in price and number. The increase will undoubtedly be more noticeable later on as the building of a new Court House will give the city and impetus such has not been enjoyed in some time. The building boom that started last summer still continues and vacant houses are as scarce as water on the desert. I hereby notify all parents and guardians of children that hereafter all persons found violating the law by killing or maiming birds as specified by the law appertaining thereto will be prosecuted to the full extent of the law. All deputy marshals and constables of this city are hereby commanded and directed to arrest such violators. Dated Grand Haven, Mich., April 7, 1893. Grand Haven Schools at the Exposition. The nominal sum of money put in to Grand Haven’s Public Schools World’s Fair exhibit was not ill spent, as at a glance at the exhibit will show. Grand Haven is one of only about a dozen city’s who will have and individual school exhibit at the Fair, and this fact all our citizens should be proud of. The work of getting it ready was begun last year and every pupil of the schools at that time has a specimen of his or her work in it. In our exhibit a specialty was made of Kindergarten work. The Kindergartens of the city are attended by about 75 pupils. It is only a few years ago that the first Kindergarten was established here but it was a success from the beginning. The Kindergarten exhibit consist of models in clay of various objects, weaving of various designs, angles &c., on card board and the forming of all manner of designs with variegated paper. The little people have done their work well and some of the designs are really quite complex. After Kindergarten comes the writing exhibit, of pupils in the Central, Clinton, Columbus, Jackson, and Beech Tree schools. The pages that contain the writing have been systematically arranged and neatly bound. The name of every pupil is signed to his or her writing. The High School pupils have a fine chemistry exhibit, also a very fine display of botanical work. It consists of a herbarium with 68 different flora found around Grand Haven and a botanical description of each plant. One book has 14 fine photographs of school scenes, namely the Central and Clinton Sts. School, view of Supt’s office, view of laboratory, view in Columbus school and views in several rooms of the Central Building. The exhibit will be given a place in the Manufactures and Liberal Arts Building. Supt. Briggs will accompany it to Chicago Sunday night and see to the arrangements of setting it up. A general invitation to the public to view the work of the students would have been given, but for the fact that there is so much danger of things being soiled and torn and a neat display is desired at the Fair. Grand Haven visitors to the Exposition should not fail to see the work of their schools there. That it will compare favorably with the work of other schools we can assure beyond doubt. The rollers in the old City grist mill have been sold and shipped to J. H. Johnston of Coopersville. Robert Bruce, chief engineer of the Roanoke is said to be desirous of obtaining the appointment of boiler Inspector at Milwaukee. Assistant Postmaster Chas. N. Dickenson was a prisoner in Libby during the Rebellion for 82 days. About 2000 men were confined in the building at that time. All who have ever visited it in its reproduced state at Chicago can imagine the crowded condition with that number of men. Boys in blue will sing the old war songs by the blue sea next Thursday at the Unitarian church. A strange phenomena was noticed here and all along the lake shore night before last. A tidal wave [seiche] rolled in carrying logs and ice that had lined the shore, 100 feet further inland. Capt. Lysaght says that the water in the lake rose four feet at least. The beach in consequence was left clean of drift wood. The phenomena has been noticed here in former years, the water some times backing up the river, and rising several feet to the great danger of the lumber shipping. The sweet-smelling arbutus is now eagerly sought for. Mason County has let the contract for a new $42,000 Court House. Chas. Lyman will be first mate on the steamer Racine again this season. The tidal wave [seiche] of Thursday did considerable damage to shipping at Chicago. The Senate confirmed the nomination of D. O. Watson as collector of customs last Saturday. Mr. Kniple who recently purchased John VanKuyl’s place on Beech Tree St. will erect a slaughter house there. The old schooner Lumberman which was sent to the bottom in a squall off Milwaukee Friday was built here and came out in 1862. She measured 152 tons and was valued at $3000. She was owned at present by Kewaunee parties. She rests in 70 feet of water with about 5 feet of her spars above water. Wm. Thieleman is making improvements under his saloon, with the intention of moving his bottling works there. H. W. Johnston has placed hot water heaters in the residence of James Young and Prof. E. L. Briggs. One of the glass factory employees from Louisville has purchased the former home of John Vanden Berg on Second St. hill. A gentleman is reported to have been here yesterday from St. Louis who was looking over ground in contemplation of building a resort hotel near Ferrysburg. Albert Troutwine arrived from Hastings today to begin preparations to open a barber shop in the Clubb building on Washington St.
One of the members of the Young Men’s Band of Christian Workers said today that the society would like to get the old Court House for their purposes in case it had to be moved when the new one is erected. Grand Haven and Spring Lakes have a great future as summer resorts. With Chicago and St. Louis to draw from we can expect to be crowded with visitors this summer. Reports from Spring Lake would indicate that wealthy Chicago people are taking hold there. The material has not yet arrived and hence no work is being done on the Spring Lake bridge. A new and loaded revolver was found near Highland Park this afternoon. Inquires at this office. Improvements to the extent of about $10,000 are being made on the Spring Lake House. An antique stairway similar to the one on the Cutler is now being built. Speculators and others are buying the vacant residences in Spring Lake moving them elsewhere and renting or selling them at a profit. Steamer Nellie leaves Grand haven for Spring Lake and Fruitport at 7:00 a.m. and at 2:00 p.m. Returning leaves Fruitport at 8:00 a.m. and at 3:00 p.m. this time-table to be in effect until further notice. A paragraph of the inaugural address of Mayor Bloecker shows that that gentleman fully appreciates the importance of improving our public parks. Allow me to make just one suggestion to the City Council through your columns. That is, that they hereafter license the bus lines between the heart of the city and Highland Park, attach a good round fee and expend the receipts in improvements upon Lake Forest Avenue. Mr. A. M. Fergusen has handsomely fitted up a large room formerly occupied by the Post Office and adjoining the present Post Offic, and will move in it May 1st. A new hard wood floor has been put in and a tasty paper put on the walls. The room will be divided by a partition in the center. The rear room will be the billiard and pool hall. Mr. Fergusen will have four tables in operation. “Fergy” as he is popularly known is not to be left behind and his place of business will be one of the finest and most commodious in the city. A building boom has struck the resorts of Spring Lake. Ground is being broke for a new and commodious hotel to be built by a Chicago syndicate who will also build a dock on the site. The hotel is to be near what is called the Waters place. A Mr. Ashley of Chicago is also building a 20 room hotel on the lake to be completed by the opening of the resort season. Mr. J. M. Cornelius and other resident sin that section are contemplating enlarging their houses for the accommodation of summer visitors. With Chicago to draw from large numbers of visitors can be expected this summer. Mrs. John Macfie will have an exhibit at the World’s Fair. D. VerWy has the contract for leveling a number of cottages at Highland Park. The steamer Racine will be here tomorrow morning on her first trip of the year. One of the fish tugs has a whistle that sounds very much like the river steamer Valley City. John VerKuyl is greatly improving his property on 3rd and Clinton street. Let all on that street follow suit. Ed Poore and Nort LaDue will have a hundred yard foot race on Franklin St. from 3d. tomorrow afternoon at two o’clock. Both claim to have a record of 10¼ seconds for that distance and a race for blood can be expected. The telephone cable was laid across the river at the Spring Lake bridge yesterday. Some of the sidewalks on Washington St. in the down town section are in horrible condition. Four boys of this city left their homes yesterday to seek their fortune elsewhere. Arriving at Muskegon and finding no opportunity to ship on a vessel they returned; somewhat crest fallen it is said. Frank Tietz was arrested by Marshal Klaver last night for drunkenness. He was brought before Justice Angel this morning and sentenced to pay a fine of $10 or go to jail for 25 days. He paid the fine. It is safe to say that Henry Doornbos & Bro. have one of the neatest wagons in Grand Haven. They appeared with their new rig yesterday, handsomely painted and as bright as a dollar. The wagon was made by DeGlopper & Yonker and was one of the most substantial ever turned out from their shop. It was built especially for the fish trade. The firemen are circulating a petition among the citizens asking for assistance in properly entertaining the State Firemen at their annual convention in Grand Haven, May 17. At the convention last year in Hillsdale it was predicted that far more delegates would come here to a convention than any other city of its size in Michigan. We can expect at least 125 visitors. Detroit, the Saginaws, Grand Rapids and nearly every other city of its size will be represented. The local firemen ask the citizens to help them in banqueting and otherwise entertaining their visitors. Every citizen approached should do all in his power. The convention is an important one and we want the many visitors to leave saying they were well treated. Building and improvements are being made in all parts of the city. The Democrats have a majority of one on the Ottawa Board of Supervisors. Our new Collector of Customs, D. O. Watxon arrived in the city this afternoon on the 2:45 train. Capt. O. E. Wilbur, of Charlevoix, Mich., has bought the steamer City of Grand Rapids for $13,000, and will run her between Grand and Little Traverse Bay. A lively war between steamboat lines will be waged this season, the contestants being the Goodrich Company and the Milwaukee & Eastern Transit Company. The latter owns the City of Fremont and the Fountain City, which hitherto traded between Milwaukee and St. Joseph, Mich., in connection with the Big Four Railroad. On May 1 these boats will be placed on the Milwaukee and Chicago route and the rates which they held for years for both freight and passengers will be cut in two. The first mates on both of the Goodrich boats are Grand Haven men. Can’t our race track be fitted up in shape so that should horsemen desire to work their horses upon it they could do so? We are informed that parties stand ready to come here with several fast horses and work them providing the track is put in shape. This would bring many horsemen to the city, and contribute to the reputation of the town in several ways. Wm. H. Loutit Contracts for a Large Steamer. Mr. W. H. Loutit has contracted with Duncan Robertson of the Grand Haven Ship Building Co., for a new steamer, dimensions of which will be length 200 feet, beam 25 feet, depth of hold 13 feet. The frames are to be of Oak from Ohio. Arch to be of steel and double steel straps. Planks to come from Tennessee and Kentucky. The boat is to be first class in every particular and be A1. The steamer City of Racine remained here today, not attempting to enter Muskegon in the somewhat heavy sea prevailing. Marine men are protesting most strenuously against the plan of the life-saving service to remove the life-saving crews from south of Chicago harbor to Jackson park during the fair. The station at the mouth of harbor here is one of the most important on the whole chain of lakes. During the coming summer, when more people will be on the water than ever before, the service of the crew, it is said by marine men, will be required imperatively. The crew at Jackson Park will be nearly useless for any other purpose than that of making an exhibit of life-saving work. The ice in the Straits is honey combed and passages will be made in a day or two. The 100 yard foot race between Nort LaDue and Ed Poore came off yesterday afternoon. Poore won handily. With the building in contemplation and now going on, Grand Haven carpenters will have one of the busiest years in the history of the city. The Muskegon News is probably wondering why it is that the Goodrich boats can make this port, and leave their so-called harbor off the route. N. Robbins, jr. is getting the material ready for a large, new ware house which he will soon build upon his dock property. The building is to be 120 feet long. The new steamer to be built for W. H. Loutit by the Grand Haven Ship Building Co., will be 200 feet long. Extreme width will be 36 feet instead of 25 feet as stated last night. Her molded depth will be 14 feet. The concert given by Beerman’s band at the Opera House last evening was spoken of in the highest terms by those who attended. The productions were all well rendered and merited the applause given. In Beerman’s Band Muskegon has one of the finest in the state. Spring Lake township is spending a great deal of money in graveling the roads within its borders. Death of Antony Van Toll. Mr. Antony Van Toll died this morning after an illness of only a few days aged 63 years. Mr. Van Toll had been at work on the tug Stickney of which he was one of the owners, up to last Saturday, when he was taken with inflammation of the bowels which terminated in his death at 10 o’clock this morning. Mr. Van Toll was born in the Netherlands, coming to this country and settling on Grand Island two and one half years when he came to Grand Haven, residing here ever since. He leaves to mourn his loss a wife, and three children; Bert, Hawley and John Van Toll. He also has three brothers residing in this city; Adrian, Aart and John. The following from the Washington Star of April 10, 1893, was kindly furnished us by Geo. D. Sanford and will be of interest to our readers. “There has always been some difference of opinion as to who was the author of the idea upon which the railway mail service is based. People who visit the World’s Fair and examine the exhibit which will be made there by the Post Office Department will see an interesting contribution to the discussion in the shape of a picture of a steamboat which contained the first traveling post office fitted out in this country. The steamer in question traveled on Lake Michigan from Grand Haven to Milwaukee and in 1860 Postmaster General Holt signed an order for this service. This was the first time that what is known in the service as a “fine distribution” of mail matter was attempted while the mail was in transit. There are several who claim the honor of being the father of this system. Mr. Armstrong who was at one time the superintendent, is generally mentioned in this connection but the origin of the service does not run farther back, according to the claim of friends, than the year 1862. Then there was Col. Maitland who organized and had charge of the transportation of the mails in the Army of the Tennessee. Col. Parker who performed a similar service for the Army of the Potomac and Mr. Davis who was connected with the service, all of whom have been mentioned as entitled to this honor. It is claimed by the post office officials who have charge of the exhibit that this steamboat contained the first traveling post office which was in operation about two years before the time claimed by all the candidates for the honor as the period when the service began. It is the opinion of those who are in a position to know that the service was a result of gradual evolution rather than the invention of any one man. However that may be they think the exhibit will be an interesting contribution to the knowledge of the early days of a service which formerly came into existence in the year 1864 and has since that time been performing an ever expanding part in the postal system of this country. Mr. Sanford says, although thirty-three years ago he remembers well Col. Worden, who was then running on the boat as postal clerk and saw Col. Worden distributing papers and letters; and also remembers well how he had his cases fixed up. He says he little thought then that this was to be the beginning of one of the wonders of the century. Mr. S suggests that it would not only be appropriate but just to have a photograph of Col. Worden placed on view with the old steamer as the first planner and worker of our wonderful mail service. Capt. Ashley has finished his 50 room boarding house on Spring Lake. The new Columbian stamped envelopes can now be obtained at the P. O. They are beauties. It will be hard work for the Muskegon News man to make those twenty more passengers, who waited at the Goodrich dock last night for the Atlanta, believe that Muskegon harbor is anything but a sham and a nuisance. The steamer Atlanta took on a little freight at Muskegon yesterday and got grounded in the “best winter harbor” on the lake in trying to get out. She did not reach here until six o’clock in the morning. C. G. Adams of Jamestown is in the city, selling his famous writing fluid. He owns a strawberry ranch and he will clear $10,000 above all expenses this year. He says that he and Mr. Henry DeKline, another moneyed man of that town have been trying to interest the people of that vicinity the importance of having a railroad to Grand Haven. Several would be passengers on the steamer Atlanta waited all night for that boat to go to Chicago. When they saw her spars loom up above the sand hill on her way in, early this morning, they started for a hotel thinking they could get a little lunch and have time to get on board. To their disgust they found when returning to the wharf that the boat had not stopped three minutes and was already clear of the harbor on her way to Chicago. Ye gods but wasn’t Muskegon cursed then. Any age, a marriageable age, seems to be the rule in this county. A marriage license was issued last week to parties aged 62 and 68 years. Two of as fine pianos as were ever seen in this city were put in the residence of Major Mansfield and B. C. Mansfield today by Vyn Bros. If the Atlanta had taken on another man, she would have been loaded so deep down that she never would have crossed the bar at Muskegon. A lot of the Atalnta’s would-be passengers stood, shivered, waited, watched—and spoke well (!) of Muskegon harbor last night, while the Atlanta labored and wallowed in the mud at that “wonderful harbor” (!) of Muskegon. The Wisconsin, Racine and Atlanta all arrived within five minutes of each other this morning. The steamer Wisconsin will make no more trips until about the first of next month. Repairs will be made on her and she will be put in readiness for the summer run. 130,000,000 white fish were planted off Muskegon yesterday. Mr. H. Kinkema is beautifying his property on Fulton near 5th St. by the planting of shade trees. Four Grand Haven young men will graduate from the University of Michigan this year: Edward P. Cummings from the literary department, James J. Danhof from the law school, John VandenBerg from the dental and Fred Gillen from the medical department. A very good showing and one which few towns in Western Michigan can equal. Fishing on the piers should be in full blast in about three weeks. Two young immigrants arrived here today from the Netherlands. They looked the typical immigrants through and through, one of them smoking a long Dutch pipe. Nell DeGlopper’s and Charley Pennoyer’s base ball nine settled their rivalry this morning by a game which resulted in favor of DeGlopper by a score of 22 to 10. Recollections of a Veteran Engineer. Mr. John Stark, was chief engineer of the “black boat” Detroit for many years, can relate many interesting reminiscences of the time of the great North Western Mails were carried between here and Milwaukee by the steamer. The D. & M. people contracted with the government in 1860 to carry the mails for five years. A fine mail room, the dimensions of which were 20 by 25 feet, was built in the steamer Detroit and six mail agents sent here from Detroit to live on the steamer during the season of navigation and attend to the distribution and sorting of all the matter. “Col. Isaac Worden, had charge of the mail department on the Detroit, although Postmaster Howard of Detroit had general supervision and the men were sent here through him. The mails were very large and on the trip to Milwaukee the men were kept busy until that port was reached. One of the men attended to the distribution of newspapers which constituted a big bulk of the matter. On the east bound trip the mail was not near as large. The Detroit left Grand Haven at five every morning, and arrived at Milwaukee in time to leave there at the same hour in the evening. It can be imagined that the mail men were kept hustling. Mr. Stark recalls a visit and trip across the lake by Admiral Worden, the famous naval officer and brother of Isaac Worden. The Admiral made the trip over and back as his brother’s guest. Postmaster Howard of Detroit would also occasionally come here and see how things were getting along. A gentleman named Fowler was assistant postmaster in Milwaukee at that time. Some years ago he called upon Mr. Stark at his home and many were the reminiscences and memories brought up. Mr. Fowler was still connected with the Milwaukee post office. He said for promptness and general work, that the mail men on the old Detroit had never been equaled. At the expiration of the five years the government made no further continuance of contracting for carrying the mail, and from that time it has gone around via Chicago. The old Detroit was commanded by Capt. D. H. McBride of Milwaukee who is now dead. Harry Bradford of Milwaukee was purser and Mr. John Stark of this city chief engineer. The Milwaukee was wrecked off here. After leaving this line the Detroit was converted into a barge and afterward dismantled in Detroit. Her engine is now on the steamer Greyhound which plies between Detroit and Port Huron. The Michigan Fish Commission’s car Attikamaug arrived today over the D., G. H. & M. with several million white fish to be planted off this port. The fish came from the hatcheries of Paris, Michigan. The fish to be planted are very small and it takes some years before their growth is attained. Prof. W. M. Davis of Harvard College, Cambridge, Mass, the meteorologist, has undertaken the investigation of the great oscillation [seiche] of Lake Michigan on April 7, and is very anxious to procure all the information possible. Eye witnesses of the occurrence would confer a great favor by visiting the professor relative to the following queries: Was any change of water level noticed in your vicinity, if so at what hour, of what height? Was it followed or proceeded by other smaller changes; was there any noticeable changes in the current of the streams entering the lake at the time? Was there a wind storm on the 7th? At what hour? The tug Edwards planted the white fish in the lake this afternoon. A large number of sailors have found employment this spring at the World’s Fair grounds repairing the roofs of the exposition buildings. As they can get $3 a day for this work and only $2 sailing, they will probably prefer to work on shore until after the spring storms. There is an ominous silence on that Atlanta episode by the Muskegon press. It is reported that the remains of the old Ironsides, which sank just south of the piers at this harbor same twenty-three years ago, have arisen and washed up on the beach. The recent storm is credited with having done the work. If is true, the sight will doubtless draw crowds to see it.—Muskegon News. Quncy, Ill., April 12.—Prof. Charles Orchardson, who was associated with Vera Ava until her arrest at Elgin and subsequent incarceration at Joliet, was married tonight to Mrs. Minerva Merrick, a wealthy widow and spiritualist leader, 32 years of age. She has $30,000 worth of property and no children. She is the builder and owner of Merrick Chapel, a handsome brick structure given over to the spiritualists for worship. Orchardson is an artist, medium and adventurer, and was at one time a candidate for Mayor of Chicago on a fusion ticket. He is 57 years of age. —Detroit Free Press. Grand Haven people know Prof. Orchardson well. For years he lived at Spring Lake with his wife and family and had an elegant home there. He employed himself mostly in painting portraits. He is a handsome man and has gained national reputation through his eccentric notions and beliefs. His connection with the great fraud Vera Ava have gained for him still more notoriety. A year ago last fall, he, accompanied by the famous Vera Ava, visited his wife at Spring Lake. At that time he was contemplating a lecturing tour with the “great mystery” as Ava has been called. Mrs. Orchardson got a divorce from her husband last summer. Highland Park and the piers were visited by a large number yesterday. A creamery will probably be started in Hudsonville. About 800 more votes were cast on the Court House proposition than on state offices. Tony VanBemelin is wearing an extraordinary large smile and passing the cigars today. His 17th birthday was yesterday. Andy Falls of Spring Lake will operate a bus line between this city and Spring Lake as soon as the bridge is passable. Wm. VandenBerg will fit up a cozy yacht to go to the World’s Fair from this city. Mr. VandenBerg’s plan is to lay off Jackson Park, upon which the grounds are situated and make the yacht the boarding and sleeping place for those who go over with him. Walter Merrill, a d. d., and a tramp was sentenced to ten days in jail by Justice Pagelson this morning. Many buildings are going up in Grand Haven township which shows that the farming community is prospering. In deference to the parents and relatives of the young men who raised a disturbance and were arrested Saturday night, no names will be mentioned. Citizens are responding nobly to the paper the firemen have in circulation for assistance in rendering an enjoyable time at the State fireman’s meet next month. The plan is to have a grand banquet on the occasion. The business meeting, will be held at the Opera House. MR. EDITOR:—I would like to see the new Court House erected on what is called Central Park, as it is more suitable for such a building, being higher, and would show off to better advantage, and would also be a saving to the city, as the City Hall and jail can remain where they are. Why can’t it be put there! D. VERWY. The ship yards were visited by the usual number of Sunday sight seers yesterday and many were the words of commendation expressed at the trim appearance of the Sands & Maxwell steamer at the G. H. Ship Builders Co.’s yard. The steamer E. G. Maxwell just completed by the Grand Haven Ship Building Co. for Sands & Maxwell of Pentwater is one of the finest little steamers ever built here. She is first class in every respect and a credit to that yard, which has tuned out many fine boats. It is fourteen years ago this week that the present Co. F was organized as Yates Light Infantry. The body of an unknown man was found on the beach at Muskegon yesterday. The list of local wheelsmen is growing larger. D. A. Lane, Chris Anderson and Mat Chambers are among the latest to join the ranks. Class of “93” Grand Haven High School is composed as follows: Ernie Gibbs, Herbert Steele, Will Brouwer, Misses Jennie Nell, Eva Gibbs, Henrietta Pagelson, Effie Hofma, Bonna Vos and Hannah VanLoo. Z. Moses has written Geo. D. Sanford from Washington that pictures of the “black boats” steamers Detroit and Milwaukee have been secured for the exhibit of the Post Office department at the World’s Fair. Another argument offered as claim that Central Park would be a more suitable place than the present Court House square for the new Court House, is that the ground is more adapted. Court House square has been filled in year after year while the center of the so called Central Park has not. Consequently a much stronger foundation at much more expense would have to be built if the Court House is erected in the present Court House square. Mayor and Mrs. Henry Bloecker celebrated their 25th wedding anniversary at their pleasant home on First St. last evening. The spacious halls and rooms were crowded with guests and friends. The Arbeiter Verein, of which Mr. Bloecker is President, attended in a body. A serenade was also given at 10 o’clock by the City Band. German toasts and American speeches were made by several members of the Arbeiter Verein. Mrs. A. VanderVeen treated those present to song in her own inimitable way. Mr. Bloecker responded feelingly to the good wishes and congratulations of his friends. Several telegrams of regret, in not being able to be present were received from friends of the family in Grand Rapids, Kalamazoo and Chicago. The halls were thrown open and dancing and social parties formed. One room was taken possession of by dancers, another for singing and recitations and a third for wine parties and refreshments. Hugo Bloecker served lunch. Among the many beautiful and costly gifts received were: Silver tea set of 12 pieces, butter bowl and mirror, from the Albeiter Verein, handsome water pitcher from the Bloecker foundry employees, elegant set of spoons from Mr. and Mrs. Joseph Kibler, beautiful basket of flowers from Miss Mary White. Mrs. Bloecker also received from her son Hugo twenty-five silver dollars; from Fritz a beautiful ring and from her daughter Emma a silver thimble. A congratulatory card was received also from Mr. Bloecker’s mother, all the way from Bromstedt, Stadt Holstein, Fatherland. Last, but not least, congratulations and good wishes from a host of friends in this city and county. A most enjoyable time and one long to be remembered was had by all who were present, and it was not until early this morning that all dispersed. It is interesting to contemplate that the present gigantic system, of the distribution and sorting of mails while they are in transit originated some 38 years ago and was first attempted from this city. That system sin now one of the wonders of the age, especially when we think of the enormous amount of mail that has to find its way to different destinations all over the country and the small amount that is lost in transit. The League Base Ball season will begin in a few days. Some years ago when the Detroit club was in its glory with such players as Hanlon, Brouthers, Rowe and Deacon White, three quarters of the city, at least, watched the base ball columns and the Cutler House nightly bulletins with and intense interest. When Detroit left the League, baseball interest flagged here, and in many other cities of the state, and it is almost a dead letter now. A mechanical steam whistle is not a fog horn and a sailing vessel using such an implement as a means of signaling while under way does so in violation of the sailing regulations established by Congress. This proposition has been laid down by the United States circuit of appeal. Another tow of logs was brought from up the river for Kilbourn today. Rain has not fallen in Rome for two months and the Pope has ordered prayers for rain. Ham Johnston, (assisted by Ald. Lewis) put a covering of asbestos on the boiler at the city pumping station last week. Peter Deneau of Montague was in town today. He contemplates making Grand Haven his home. A son of his is a surfman in the Life Saving Station here. Mr. Geo. Friant of Muskegon, a former resident and veteran mill man of this city is in town today. In mill days Mr. Friant ran the White & Friant. “Grand Haven is getting ready to build a new court house,” said Jacob Baar of that city, in the New Livingston, yesterday. “We were very much gratified at the way the election went. Usually those court house questions have to be voted on several times and there is always more or less pulling and hauling, but this spring the proposition to raise $27,000 was carried easily. To this sum was added $15,000 raised by the citizens of Grand Haven and together it will make a handsome building. Grand Haven is progressing well this year and we expect a busy season. Shipping promises to be lively; in fact has opened up splendidly already.”—G. R. Democrat. EDITOR—I see that some citizens are urging the Central Park as the most valuable site for the new court house. I think it would be a great deal better to use it for that purpose than for the purpose the city is putting it to at present, by making it the dumping place for all the filth on our streets, and the breeding place for cholera and other diseases. M. D.
“Ye Infants” to the Frost. A characteristic little entertainment was given at the residence of Col. Duryea last evening. Ten young girls produced in a very acceptable and charming manner the little comedy Cinderilla. Miss Nina Duryea taking the part of the Prince, Miss Lulu Emlaw that of Cinderilla, Miss Leila Soule, the Page, Miss Kate VanderVeen, the Stepmother, Misses Jeswin Reynolds and Virgle Balir, the ill-natured sisters, Miss Grace Killbourne, the Fairy Godmother, Miss Martie LaDue, Miss Eva Craw, and Miss Bessie Koeltz, the Lords in Waiting. Each acted so well her part that it would be impossible to discriminate. All were stars and the costumes rich and appropriate. Between the sets a tableau was introduced, the “Prince in the Tower” by Eva Craw and Miss Nina Duryea, song, by Miss Eva Craw and a recitation of Hiawatha by Miss Lulu Emlaw. The entertainment closed with some beautiful fancy dancing by Miss Martie LaDue. Miss Mary Soule rendered the music in her usual happy manner. The house was crowded to excess many hardly finding standing room. The object of the little entertainment was for the benefit of the Guild room of St. John’s church. The tug Miller was put on the beach by her crew about four miles north of this port this afternoon. It is surmised that she was leaking badly and for the safety of her crew she was beached. The Life Saving Station men stated that the crew left the tug when she beached. The tugs Auger and Annie left for her at 3:30 to investigate and see what the trouble is. Although the secretary of state has nine counties, including Wayne, to hear from on the vote of the Grand river improvement amendment, there is no doubt that it carried. The majority for it will be in the neighborhood of 20,000. All the amendments carried. The state canvassing board will meet next Tuesday, and a detailed statement of the vote cannot be secured until after that date. The steamer Samson arrived today from up the river on the first trip of the season. She brought down a load of slabs for D. Vyn. A Victim of a Criminal Operation. The body was taken to McColums morgue for identification. Last night a telephone message for Peter Wild was received here. It merely stated that Alice Wild was dead, and was from Coroner Bradish. Before this message was received here Mr. Wild was on his way to Gr’d Rapids, having entertained fears that the woman spoken of in the morning papers was his daughter. He arrived at Grand Rapids at 11 o’clock p.m. and proceeded at once to the morgue. He identified the body positively as that of his daughter Alice. Alice Wild left this city about three weeks ago to visit relatives at Six Corners, near the town of Conklin. It seems, according to the testimony brought forward at the inquest yesterday by Grand Rapids relatives, that she had been in the latter city for about that length of time. It was these relatives that first identified Alice. They saw the clothes that she wore at the boarding house where she died and identified them as hers. Later they identified her body and the telephone message was sent here. Alice Wild was well-known here. She lived, when not working out, with her father and step-mother, her own mother having died years ago. She went to school up to the time of leaving for Grand Rapids and was in the room next below the High School, of which Miss Holzinger is teacher. That she died of a criminal operation is certain. The inquest to be held this afternoon will undoubtedly throw more light on the affair. Ald. Koeltz’ large sign across the walk at his place of business was blown down last night. Citizens are just beginning to awaken to the fact that the death of Alice Wild can be summed up in the terrible word MURDER! During the gale of last night a heavy board was carried in the wind through the kitchen of Mrs. Palmer’s boarding house. The board went through siding, lath and plaster. The 18 year old son of Mr. Thos. Fisher ran away from home yesterday and it was stated with a boy named Johnson of the 4th ward. Nothing had been heard of the pair this morning. As strong an east wind as the one of last night is a strange thing here. The usual high winds are from the west and northwest. But all day yesterday and up to noon today it blew great guns from the east, attaining a velocity of some where between 40 and 50 miles an hour. Now that the enormity of the terrible crime committed in the death of Alice Wild is brought forth; the murders of the child, directly and indirectly are undoubtedly quaking. If never brought before the tribunal of justice, they will at least, go to their graves with a conscience that is, by no means, as clear as a cloudless sky. If not murderers what are they? Last night’s wind served to carry away several street signs. The present Council should take immediate action on removing these street signs. At all times they are a menace to life and limb, and it is a wonder that more people have not been hurt by falling signs here. The usual prevailing winds make it unsafe for pedestrians on the sidewalks. Begin right away and have all signs across the walks and on the sides of the walks removed. The fish tug John A. Miller sprung a leak about 12 miles off this port yesterday afternoon. The water poured into the hold in a steady stream. Capt. VerDuin saw the predicament he was in and to save the tug and mayhap the lives of his crew headed straight for the beach. She went aground in 9 feet of water and none too soon. If she had remained in the open lake 30 minutes more or attempted to make this port she would have surely sunk and another marine disaster would have been chronicled today. The strange movements of the tug were watched by the Life Saving Crew. Suspecting something wrong Capt. Lysaght of the station notified the tug’s owners. The life boat was got out and the crew pulled with a will for the unfortunate tug. The pull was a long one as the tug was about 7 miles north of the station. Arriving at their goal the Life Savers found a serious state of affairs. The Miller was as full of water as she could be. The crew were bailing her out with tubs, boxes, pans and the siphon and pony pump were working. The tugs Augur and Annie arrived shortly after and the station men took a line to them and the Miller was towed to this port. She will be taken to Muskegon in a few days to be put on dry dock for a much needed recaulking. That a horrible crime has been committed in the death of Alice Wild, no one doubts, and that the guilty shall be brought to justice is demanded by the public, is expressed by every upright citizen, and they can rest assured that Sheriff Keppel and Prosecuter Visscher are not the men to let it go without getting at the truth of this terrible murder of a mere child. The grocery store of john Ritzema on Jackson St. opposite the C. & W. M. depot, was burglarized during the wild storm of last night or early this morning. The burglars first attempted to get in through a rear window. Strong night blinds were up at this window and they gave up the attempt there. Next they turned their attention to a latched opening in a room back of the store, where Mr. Ritzema keeps his flour, etc. Inside this room they had a tartar to contend with before reaching the main store, in the shape of a double door. Made still secure by two bars of two by fours. From marks on the door it seemed that they first attempted to cut a hole in the center of it and with a knife or some other article lift up the bars. This plan was also given up, but by the dint of much prying they probably loosened the support of the bars and by pushing some article as a knife or saw through the narrow aperture lifted the bars and pushed the door open. When seen this morning Mr. Ritzema said he did not know exactly how much was taken. His cigar case containing 10 or 12 boxes, was cleaned out completely. Quite an amount of dry goods are also missing. The thieves rummaged through the whole stock. Dry goods and groceries littered the floor when the store was opened up in the morning. One bundle of dry goods was found on the steps in the rear of the store, and another in front, the thieves having left it, evidently having too much to carry. The only clues left was a blacksmith hammer, which they had used in entering, and the impress of a shoe on one of the flour sacks in the rear room. By appearance the shoe was evidently a new one. Two officers are at work on the case. The Roanoke started for Milwaukee last night, but put back after 5 hours. A very heavy sea undoubtedly prevailed on the west shore. The handsome steamer Bon Voyage which was wintered at this port will ply in the World’s Fair trade this season. She will make occasional trips between here and other points to Chicago, and will remain off the Exposition grounds for several days at a time and board all those who go over on her. The steamer is being fitted out now. A company of capitalists, including Messrs. Berkey, Hompy, Ferris and others of the Royal Furniture company, of Grand Rapids, have determined on the erection of a a handsome boarding house on the old Craw place on Spring Lake. It will have 25 rooms besides other apartments and be connected with the two cottages now owned by Messrs. Hompy and Ferris. This is one of the finest fronts on the lake. Prof. Baird, of the Evanston university, has lately purchased 400 feet front of Clarence Walker and will improve it this season. Below him Mr. Pease of Chicago, will erect a cottage on a beautiful site purchased of Mr. Weller last year. The continuation of the inquest upon the death of Alice Wild was held in the office of Coroner Bradish of Grand Rapids yesterday afternoon. The little room was crowded with spectators and officials. Peter Wild the father of the girl was the first witness called to the stand. According to the Grand Rapids Democrat he said: “Alice has not been living at home for a long time. The last time I saw her was five weeks ago, and she said she was going to Grand Rapids. I advised her not to go, but she said she was going. She had been living in the family of a Mr. Brice, and going to school, and later she worked for Edward Gillen. The witness knew nothing of the girl’s friends or condition. He said he once advised her to leave Gillen’s, as he did not like to have her there, but she insisted upon remaining. He tried to force her to leave, but could not. The next he heard of his daughter was when he read in the papers about a girl who died in this city. The description so strongly resembled his daughter that he asked the sheriff of Grand Haven to investigate the case, and finally became satisfied that it was his daughter and came to this city and identified her. County Physician Penwarden described the condition of the body. He found that death was caused by inflammation of the bowels and this inflammation was such as to indicate that an instrument had been used in the organs. “Did Mrs. White know the girl?” asked Prosecuting Attorney Wolcott. Now comes the startler. Coroner Bradish yesterday morning received a letter postmarked Grand Haven. The writer stated that he had read the description of the dead girl in Tuesday’s papers and believed she must be Alice Wild. The letter was signed “Grand Haven.” Coronor Bradish thinks the writer must know something of the girl. The inquest was adjourned until next Saturday. The body arrived last night on the 6:18 D., G. H. & M. train. A large crowd moved by morbid interest in the affair assembled at the depot and talked together in little groups of their suspicions and thoughts. The body was taken to the home of Mr. Wild. Mr. H. O. Sanford is suffering with a cracked rib received in a friendly bout with gentleman Dan Pagelson, who by the way is getting to be quite proficient with his dukes. Mr. Sanford will be laid up several days, the doctor says. Messrs. Geo. W. McBride and Sherman H. Boyce have been appointed as citizens advisory committee to act with the committee on County Buildings in the erection of the new court house. Ex-Ald. John Bryce and A. J. Vanderwater and E. S. Madison of Grand Rapids have organized what will be known as the Grand Haven Flooring Manufacturing Co. They will conduct their business in the old Waite planning mill. The runaway boys reported yesterday have returned home. Dan Pagelson will figure as defendant in a sensational suit for damages to be brought by Henry Sanford in the next term of court it is said. Of course the Racine did not attempt to make Muskegon, but remained at her dock all day. In storms like these Grand Haven is the only safe port on this shore. The committee on County Buildings of the Board of Supervisors will leave Monday for a tour of inspection of several Court Houses. They will visit Allegan and Charlotte and returning stop at Grand Rapids to view the plans of the Mason county court house to be built at Ludington. A Grand Rapids contractor was granted the contract for that building. Resolved, that the Committee on Buildings be instructed to have plans and specifications made for the proposed new Court House (within the limits of the appropriations made for that purpose) within 30 days after date if practical, and such plans and specifications be submitted to the Board at the call of said committee. Half an inch of snow on the 21st of April, 1893. Paste that in your hat. Despite the storm the Atlanta cleared for Chicago last night and the Racine arrived at 8 this morning. The Grand Rapids Herald came out in a scathing editorial yesterday, urging the officers to ferret out the mysteries of Alice Wild’s death. A gentleman named Thomas will shortly open up a restaurant in the building so long occupied by E. L. VanWormer restaurant. The electric light globe, corner Fulton and 4Sts. Has been broken for the past six weeks and residents in that vicinity complain of the poor light there. Dr. Graves delivered his very interesting lecture “My Escape From Slavery” in Miss Holzinger’s room in the Central School building yesterday. Mr. Wade of Douglas was in the city yesterday getting pointers on running a daily paper he intends starting at Holland City. Mr. Wade will find it easy enough to start a paper but to keep it going is where he will have the trouble. Fourteen men employed in the lake tunnel in Milwaukee met their death in the icy waters of Lake Michigan yesterday morning. The men slept at the crib in a little house which was carried away. Only one man was saved. [This extremely dramatic and tragic event came to be known as the “Milwaukee Pier Horror” eclipsed only by a similar tragedy at the water intake crib at Chicago where over two dozen workers perished. MR. EDITOR: It was a sad and quiet crowd mingled perhaps with a little curiosity that gathered in the Presbyterian church at 3:30 p.m. yesterday to give Christian recognition to the remains of Alice Wild. The hymn and scripture selections, the latter read in a tearful voice by Rev. Mr. Lewis, spoke of sorrow for a world and people lost through sin and also hope through a merciful Redeemer. Rev. Mr. Kennedy’s prayer (which might be called a sermon) was a wail of penitence and humiliation, and a plea for mercy. The flowers (God’s smiles some one has fitly called them) were the offering of the G. A. R., The Christian Endeavor, (may their endeavors be redoubled,) the Grammar room, of which Alice was a pupil, and others. At the close of the sermon there was a long pause, the congregation seemed loath to move, expecting perhaps the avenging angel to appear and divulge the mystery of Alice wild’s murder. During the pause me thinks every mother’s heart in God’s presence went up in an earnest prayer for justice and protection of their daughters and sons, who ought to be the defenders of the rights and purity of undefended womanhood. But the spell passed and all that was mortal of the neglected wronged child was carried to Lake Forrest cemetery. We hope for the sake of other defenseless children that all the light on the crime is not buried in the grave of Alice Wild. Geo. A. Farr will deliver the address at Holland Memorial day. Keno tonight for Cleveland aluminum medals at City Hotel. Winds up with a mammoth lunch. An immigrant named Temple from the city of Gronigen, Netherlands, arrived here yesterday. He is a relative of Mr. R. Temple. John Kooilman received three valuable English Beagles by express this morning. Mr. Kooilman intends opening a dog kennel and will have as fine hunting breed as any kennel in the state. There was no foundation to the report that the Ritzema store burglars had been captured with their plunder. A few cigars were found on a sidewalk near the C. & W. M. depot, but they were probably lost there by the thieves while leaving the store. For some reason the spiles for the Spring Lake bridge have not yet arrived and the work of rebuilding that structure is yet to begin. The other material is all on the ground. EDITOR TRIBUNE:—It having being falsely circulated that I am Game Warden in and for Ottawa county. I wish to state that I am not Game Warden, never have been, never expect to be. Yours for the truth. The plan of supplying Grand Rapids with Lake Michigan water is being agitated. Boston gets her water supply from 60 miles distant. One objection to the plan is the grade, but a Supervisor of the Valley City thinks this would be obviated if a stand pipe were erected on one of Grand Haven’s hills. Sportsmen in Holland and vicinity are making efforts to introduce the Mongolian Pheasant into the country roundabouts. This is because quails are becoming exterminated on account of the severe winters. These pheasants are said to be very hardy birds, and it is thought they would do very well in the region as they are raised successfully in Canada, where the snow is deep and the temperature is from 15° to 20° below zero. The owners of the handsome steamer E. G. Maxwell may decide to make Grand Haven the southern terminus of their line instead of Muskegon. The facilities are better here in every way. In such a case the Maxwell will merely stop at Muskegon piers. This northern line will be welcomed here. The tug Miller will be placed on dry dock here. The owners of the tug Miller are rigging up their sail boats again to be used until the repairs on the tug are completed. The river boats will probably begin running next week. Mr. N. Robbins Jr. informs us; but no definite date has been fixed. C. C. Nichols, engineer on Capt. Kirby’s tug J. W. Callister has put an appliance on board that tug for the purpose of assisting in lifting nets. After turning around and heading for her dock, preparatory to leaving for Muskegon at 10 o’clock this morning, the steamer Atlanta smashed into the Nellie which was tied at the wharf. Eight or ten stanchions were broken and the bulwark damaged. No bounty on sparrows will be paid from April to November here after. In the early 70’s a boat line between Pentwater and Montague and Grand Haven was not a novel thing. The steamers Doyle, Merchant and John A. Dix made daily trips between those ports. The old Dix is still running from Chicago, taking excursion parties to Michigan City and Milwaukee. She is getting rather old though and some years ago ran into Milwaukee with an excursion load of several hundred and in a water logged condition. Everything is all bustle on the steamer Wisconsin as she lies in an ordinary, north of the D. & M., freight house. A force of painters are at work on her cabins. Her brass and inside work are being painted and polished to perfection and she will leave on the summer route next Wednesday looking as handsome as ever, despite the shifts and knocks she endured in the ice of Lake Michigan the past winter. Chicago News Record: Capt. Gee of the City of Racine thought no more of taking his vessel across the lake Thursday night than if it were an excursion yacht to Lincoln park on a calm evening. He said that the storm of the night before was one of the worst he was ever out in, but he brought his boat into port from Grand Haven on time. Because of the many misrepresentations and misstatements as to what it will cost to see the World’s Fair, President Higginbotham has issued a circular correcting such statements. He states “The exposition will open May 1st. There is no charge for drinking water as has been said. And abundance of pure water can be had. Hygeia water will be sold for one cent a cup. Provisions for seating will be made without charge. About 500 toilet rooms and closets will be located on the grounds and be absolutely free. The use of lavatories a charge of 5 cents will be made. The admission fee will be 50 cents and will entitle the visitor to enter all the buildings and inspect the exhibits except the Esqumaux village and the cliff dwellings for which a moderate fee will be charged. Imposition or extortion will not be tolerated. Free Hospitals are provided on the grounds. Free waiting rooms will be placed in different parts of the grounds. Klaver Bros. have repainted in a handsome style James Riley’s omnibus. Messrs. Cambell and Post have arranged to continue their work as musical instructors in Akeley Institute next season with Annie Martin of Charlotte as assistant. The Manistee Democrat says that dogs run unrestrained, unmuzzled and unlicensed through that city. The Democrat is led to say that laws against men are enforced but ordinances against dogs are dead letters. The same case is true here. A citizen suggests that the old Ottawa County Court House be saved in its external form at least. So few of the old buildings of former days remain extant in this city that it would be nice to save it as a reminder of those times. Turning it over to a charitable or Christian institution has been suggested. EDITOR TRIBUNE: The citizens in general and mothers in particular are anxious to know what the Sheriff and Prosecuting Attorney are doing to clear the mystery connected with the death of Alice Wild. The Grand Rapids jury have failed to throw any light on it, neither did they clear the guilty. “Now that Grand Haven is to have a new court house the usual row over the site is in order.” We clip from the Grand Rapids Herald: No row at Grand Haven on that score. Rev. Wm. Ferry years ago ceded the Court House square to Ottawa County. All are happy to the site as well as the splendid majority of county and city for the new Court House. The Board of Supervisors Saturday promptly appointed and able and competent building committee who mean business and a structure that shall reflect the pride and unanimity of sentiment of the people. That a substantial and tasteful Court House shall be the song of the city of Grand Haven instead of the usual row over the Court House site. T. A. Parish. Mr. and Mrs. Peter Wild desire to thank Mrs. J. W. Kibler for her kindness to them in their late bereavement. The Muskegon Chronicle is urging editorially that the bar at the mouth of their harbor be dredged out. They do not wish the experience of the Atlanta repeated again. Her friends are pleased to learn that Dr. Elizabeth Hofma has returned from Chicago where she has just completed a year of hospital work. The Dr. graduated from the Northwestern University Woman’s Medical school in the spring of 1891, and has since then devoted her time to the practice of medicine. We are told she will open an office room in the Howlett Block. That’s right. Only a Girl Murdered, That’s All. It would seem from this that the whole affair is being quietly hushed up, at least the Grand Rapids end of the case. The humble condition of the dead girl while in life should not deter the search for her murderer or murderers. In six more days the World’s Fair will open. For sensation in this city, the year 1893 takes the cake. The Holland City News has made a decided stand against parochial schools and hints strongly at the schools of the Holland Christian Reformed churches. About 80 pupils attend the school held in the First Christian Reformed church. The studies are in the Holland language. Grand Haven is going to have a court house just as sure as retribution. Its going to be a little the smoothest thing in the way of a court house that ever decorated a corner lot. That’s what George McBride says, and he’s a connoisseur of court houses and female seminaries.—G. R. Herald. Ordinarily Grand Haven is one of the most law abiding cities in the state. But there is one nuisance which citizens in general speak of, and that is the crowd of loungers, young men and boys who stand around the church doors every Sunday night. Many of them are far from gentlemanly and reports are heard of insulting remarks directed at passers by. The Marshal should continue the good work which he began last year and stop this nuisance. The Spring Lake house will undoubtedly do a big business this year as bookings are numerous. Never before has a season opened so auspiciously for Grand Haven. Carpenters, masons and all workmen are busy. In justice to the officers of Ottawa County it should be stated that they are powerless to do anything in the Alice Wild case. The crime was committed in Kent Co., and the Kent County officers are supposed to be ferreting it out. On account of the World’s Fair, Labor Day is to be celebrated April 30th instead of May 1st. in Honor of the New Major. For the first time in five years, a change, has been made in the commissioned staff of “Co. F.” A special election for the purpose of filling the vacancy caused by the promotion of Captain Mansfield to majorship, was the occasion of a gathering of the “brave boys in blue” at the armory last evening; and the event was one not soon to be forgotten. It marks, and will chronicle on the records of the organization, the beginning of a new epoch in its history. Vacancies on the regimental staff are by no means frequent occurrences and few companies in the State Troops experience the pride which follows the honor of having one of its officers promoted to regimental staff. Co. F is now among the few, and they celebrated the honor last evening with a grand banquet in honor of Major F. A. Mansfield. At eight o’clock the company was called to order by Lieut. Pellegrom and after the usual routine of business, the formality of an election was gone through with (for the new officers had already been chosen in the minds and hearts of the boys.) The ballots resulted in the unanimous election of Baltus Pelegrom for captain; E. H. Andres, 1st Lieut. ; W. F. Harbeck, 2nd Lieut. ; amidst the cheers of their assembled comrades. Captain Pelegrom assumes the command with the experience of nearly eight years as a commissioned officer and is therefore duly qualified to hold the responsible office that his comrades have chosen him to. Those who know him best, feel surest that he will make, not only and able and proficient commander, but a record for himself and his company. As to the new lieutenants, they have not only the recognized ability to fill their new positions, but enter upon their duties with experience and the respect and love, of every member of the company. The election, being over, the company was given to assemble about the supper table which by the way, was filled with all the good things and choice delicacies that go to make up a sumptuous repast. With Corp. Pennoyer and Private Mansfield under the command of Serg’t Rosbach, acting as reserve to supply the victuals, the destructive forces of good hearty appetites were soon active in operation along the entire line. After the toothpicks and “appollinaris water” were served, “Deacon Hutty” who was appointed toastmaster for the occasion, took charge and in his own imitable style delivered the opening address and was followed with flows of rhetoric and eloquence, heretofore unknown, on toasts as follows, viz; “Co. F as I found it and Co. F as I leave it,” by Captain B. Pellegrom; “What I know about being 2nd Lieut. in Co. F,” by Lieut. E. Andres; “The duties of first Serg’t,” by Lieut. W. F. Harbeck; “Views on what ought to be done to make Co. F a successful Co.” by Serg’t H. Nyland; “What I know about being corporal of the guard,” by Corp. W. Bidgood; “The Ladies,” by Corp. E. Pennoyer; “What I think of Camp Life,” by Private Wm. Saby; “Co F going to the World’s Fair,” by Serg’t Jas. VerHoeks. The meeting adjourned at a late hour, all feeling that the evening had been well spent. The Congregational church was filled to its capacity last evening to listen to the candidates for the Demorest Prohibition Prize Medal and many went away without getting it. Each of the six contestants did so well that it would be difficult for the audience to tell which should receive the Medal. The general verdict was that all deserved one, but the beautiful prize was awarded by the three judges to Jay Johnson of Ferrysburg. Now that Jay has taken the Medal for telling us how to Curtail the Liquor Traffic may we be given wisdom and courage to put into practical use the sentiments or achieve that won him the Medal. It took the steamer Racine fully three quarters of an hour to turn around last night because of the swift current in the river. Our marshal and night watch will appear on the street with their police uniforms soon. The dead limbs on some of the trees around Court House square should be cut off. Many of the dead limbs will remain as effects of the big fire. Some one borrowed an extension ladder of Klaver Bros., the painters, last fall. The party doing so will confer a great favor by returning it to them. D. O. Watson took charge of Grand Haven Custom House today. G. B. Parks will be his special deputy. S. O. Eaines has been retained as marine clerk. O. Hubert has on exhibition at A. Kiel’s furniture store a wagon jack of his invention. It is a very ingenious affair and Mr. Hubert and Wm. Thieleman have gone into partnership to manufacture it on a large scale. A 19½ pound pickerel was caught in a gill net outside the piers today. No city of its size is more favored with transportation facilities than Grand Haven. In the Detroit, Grand Haven & Milwaukee and the Chicago & West Michigan, we have two of the principle roads of the state. The handsome Goodrich steamers leave here every night and arrive in the World’s Fair City early next morning. Later on in the season a third boat will be added to this route. The Cream City (Milwaukee) is only a few hours distant by the substantial boats City of Milwaukee and Wisconsin. The river boats will run this year as usual between here and Grand Rapids. Two steamers will probably be put on the Spring Lake resort route this summer. The steamer E. G. Maxwell will also run between Grand Haven, Montague and Pentwater, connecting those towns with the Goodrich and D. & M. boats. This is an entirely new route as it is many years since boats plied between here and Pentwater. The World’s Fair steamer, Bon Voyage, will make weekly trips between here and Chicago. Last, but not least, comes the iron ore steamer, McGregor, which will connect us in an important way with Escanaba. Later on in the season also, fruit steamers will undoubtedly be placed on the Saugatuck-Grand Haven route. To the Taxpayers of Grand Haven. The Board of Education is at present obliged to rent four rooms for the accommodation of the schools at an annual cost of $250. Two of the rooms are in the Holland school building on Jackson St., one in the basement of the Cong’l church, and one in the Guild room of the Episcopal church. None of these are well adapted to the needs of the schools, but have been taken as the best temporary expedients that presented themselves to the Board. They are deficient in play-grounds, in ventilation, in lighting, and in other features that make modern schools healthful and delightsome to the children. The Jackson St. school grounds are especially filthy and wet in stormy weather which is so liable to prevail in spring and fall. There are at present 170 children attending these four rooms. Six additional rooms are needed to receive the children from the other Jackson St. school which, though owned by the city is poorly adapted to the use of a primary school, and to provide extra room for the growth of the next few years. The building or buildings necessary to afford these accommodations could be constructed for about $8000. If the city were bonded for this amount, the bonds to be paid $1000 a year after five years, they could probably be sold at par with 4 per cent interest. This would make the annual cost to the city less, even, than the present rent and would afford to the children of the city appropriate, healthful and convenient accommodations in all schools. The schooner Indian Bill of Muskegon, Capt. Frank Bean, is in port today with a load of slabs. She is one of the homeliest looking crafts that sail the lakes, which her captain does not deny. Capt. Bean, by the way says that when he built her some years ago, he intended to name the boat C. H. Hackley after Muskegon’s philanthropic millionaire. He says that Hackley heard of his plan and threatened to serve an injunction on him. Bean then named the boat after an old Indian well known in that section as Indian Bill. Bill was killed by the cars at Muskegon last fall when paralyzed drunk. Capt. Bean is a happy go lucky fellow and is in the coasting business for pleasure as well as work, he says. Two very desirable cottages for sale at Highland Park. Inquire of Jacob Baar. D. Wright has placed in his confectionary one of the finest soda fountains in Western Michigan, and if you desire a glass of soda step in there tomorrow. It is rather strange coincidence that the residence of Mr. Ringleberg on Columbus St., was struck by lightning a year ago last night and at about the same hour that the bolt entered the Corn Planter building last evening. The Court House committee returned home from their tour of inspection last night. The committee visited the court houses in Allegan, Hastings, charlotte, Ionia and Grand Rapids. Chairman Bloecker said that the building at Ionia most conformed with the plans of the committee. Allegan court house is a tasteful one on the exterior but the ventilation is not perfect. Hastings court house is not quite completed. Mr. Bloecker said that the vault rooms in some of the buildings were not quite as much as should be. Yesterday they visited the big Kent Co. structure. The committee will meet next Monday at Holland and the concluding arrangements will be perfected, before going to the architect and builder. The city needs another school building and it should be built at once. Why should the school officers of this city be compelled to huddle children in basements and other places unfit for the purpose? Lightning entered the Kit factory in the electrical storm of last night, disabling the machinery so that part of the employees are not working today. Mr. Haughey of Peach Plains contemplates opening a livery stable in the building on Washington St., occupied by J. T. Percival as a feed store in former years. Fire at the Planter Works. Warehouse No. 4 of the Corn Planter factory was struck by lightning at 8 o’clock last night. The bolt set the building afire and an alarm was immediately turned in. The employees were working last night when the building was struck and they lent their efforts assisting the firemen in saving the building. Warehouse No. 4 is situated just back of the office and was filled with refrigerators and appliances. President Sheldon said today that the loss would foot up to $2000 0r $3000 on the building and its contents. Mr. Sheldon spoke in the highest terms of the work of the firemen and factory employees. Sheriff Keppel brought down from Coopersville yesterday, a young fellow named Edwin Terry, for the serious crime of shooting at his neighbor’s children. Terry’s folks live in the township of Wright, and have has neighbors a family named Wallace. Notwithstanding, the two families are not on neighborly terms and have had several quarrels. The Wallace children enraged young Terry the other day and he is alleged to have shot at them with a 38 caliber revolver. Several bullets were found in the side of the house. Sheriff Keppel made the complaint himself and arrested the fellow yesterday. He was brought before Judge Cole of Polkton and remanded to appear before him next Monday. In default of $1000 bond he was taken to jail. Terry is only 19 years of age and states that he is innocent. If the charge is true the Penitentiary is the proper place of residence for him. The Valley City and the Barrett will run under one management this season. The Barrett will start next Monday and the Valley City as soon as business warrants it. Yesterday was the anniversary of Gen. Grant’s birthday. A glance at the Cutler House registration shows plenty of guests at that popular hotel. It is hinted that considerable unlawful fishing is going on in the bayous of the Grand River. A monument will be placed at the grave of Geo. Sheldon in Lake Forest cemetery. John Young contemplates opening his new saloon adjoining the Washington House tomorrow. Marshal Klaver and night watch Cook are wearing those handsome new uniforms, and the cops are the admiration of the city now. A finer office could not be asked for than the one N. Robbins Jr. now occupies. Neat and light, it cannot be beat. Mr. Robbins will soon place in it a handsome office desk. Lightning entered the Electric Light Plant Wednesday night, and made things lively for a time as Ald. Lewis and Chief Palmer who were there can attest. Several lights about the city were burned out. The old Percival building which is soon to be occupied by L. Haughey as a livery stable has had quite a history. It was built originally as a Republican wigwam and many were the speeches made there in the Grant-Greely campaign. MR. EDITOR.—One word in behalf of our young girls or school children. Can anyone tell why a child must go out into the streets with no shelter or protection, in time of stormy weather at recess? Too far to go home, and not allowed to remain under shelter of the school building, so must the children endanger their health and is there no help or care for them? Both the Barrett and the new steamer, the Valley City, will run on the river this year under the style of the Valley City Transportation Company, with Capt. Muir as manager of both boats. The Barrett will make tri-weekly trips to Grand Haven alone for the present, or until business warrants additional facilities, and then the Valley City will be put into commission to make daily round trips. The Barrett will leave her dock in this city at 9 o’clock Monday, Wednesday and Friday mornings, arriving in Grand Haven about 4 o’clock and will return Tuesday, Thursday and Saturdays. The Valley City will probably go on route about June 2, by which time the foliage along the river will be sought after by excursion parties.—G. R. Democrat. The schooner Indian Bill and her inflatable commander, Capt. Bean, are still in port. The Capt. Sold his cargo and has been hard at work today unloading the slabs on the N. Robbins Jr. dock. Mr. Robbins was the purchaser. During the recent electrical storm one dozen electrical lamps were burned out. Most of them were centered in the 7th St. section. Probate Judge J. V. B. Goodrich witnessed the famous battle between the Monitor and Merrimac. Mr. Goodrich served through the entire war. The early morning fast train will be put on the D., G. H. & M. Monday morning May 1st. The steamer Wisconsin will arrive here that morning to connect with it. I can sell you a house and lot worth $600 for $250, if you have the cash. Don’t pay rent any longer. Two blocks south of Washington street and title perfect. Will sell you a splendid house on Seventh street for $550. big house, good condition, brick cellar. John Bryce now rides a handsome P. D. Q. pneumatic. The photograph car will go to Fremont Monday. H. Fritz’s amateur nine were defeated by John Sullivan’s nine by a score of 13 to 3 this afternoon. The city marshal at Kalamazoo is making the fur fly since his re-election. The patrolmen cannot smoke while on duty or go into a saloon whether on or off duty. Bicycle riders are also compelled to walk chalk. A law has been passed by the state legislature prohibiting barber shops from keeping open on Sunday’s after May 30. A new livery stable, an new saloon and a new sewing machine agency are among the evidences of the past month that Grand Haven is growing. John M. Cook and wife of Grand Haven visited relatives in this city this week. The papers have it that John has just received a pardon from the Queen of Holland for desertion from military service. This was real kind on the part of the queen, but it reminds us of an incident in the life of the late Gen. Toombs of Georgia, who to his dying day remained an unrepenting rebel. When asked shortly before his death whether he had applied to the U. S. government for a pardon or a removal of his political disabilities he retorted with emphasis: “What, pardon? I haven’t forgiven them myself.”—Holland News. Capt. Jas. Hopkins of Saugatuck will command the Lizzie Walsh this year. The Goodrich steamer will undoubtedly be crowded with passengers tomorrow night on their way to the World’s Fair Opening. Because of the cold weather the fishing season will begin rather late this year. In past years the pier has been crowded with fishers at this time. The government tug Williams arrived this afternoon with a pile driver. The driver will got to work on that part of the pier that was carried away by the flood [seiche?]. The Williams will return to Holland. The schooner Lena Behm arrived this afternoon after being out on her first trip of the season. Those old officers, Capt. Smallman and Chief Engineer Barron will return to their positions on the City of Milwaukee. The marine exhibit in the transportation building of the World’s Fair will be the finest ever brought together. The wrecking tug Albert J. Wright which was badly burned just north of the D., G. H. & M. depot last winter, has sunk at her moorings. Harbor Master Klaver has notified Messrs. Leathem & Smith, of Sturgeon Bay, its owners to remove the hulk.